Stockholm Weather – When Is Best Time To Visit Stockholm? Stockholm Weather – Stockholm is unarguably one of Europe’s most beautiful cities, and everyone I’ve met who has been there has had a great time. There is however, nearly always one complaint – the weather. “The people are friendly, the city is beautiful, the girls are stunning – but the weather is horrible!” – is usually how it goes. Stockholm has a really harsh climate, but when the weather is nice, it’s absolutely amazing! If you get there at the right time, you’ll get the best of everything, but if you’re there at the wrong time of the year – you won’t want to step out of the door..! Stockholm Weather – When Is The Best Time To Visit Stockholm? June to August is typically the best months to visit Stockholm. This is during the summer, and the summer season in Sweden really is unlike most other countries in the world: the sun never sets! In Stockholm it’s only gone for about an hour before it comes back again. The dark months are long and cold in Sweden, so when the summer comes people want to do nothing else but being outside enjoying the weather. The summers are packed with locals (and tourists) in Stockholm, and you can enjoy the best of Stockholm at this time of the year. The fact that you can go swimming in the middle of the city is pretty special, but there are also hundreds of islands to take a trip to. At this time of the year there are tons of things to do; island hopping, outside concerts, canoeing etc. 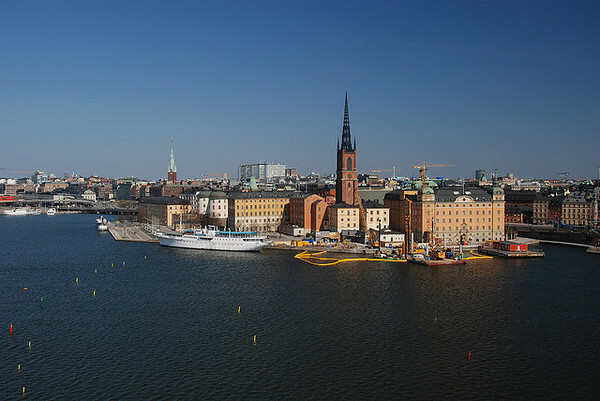 July is the hottest month in Stockholm, averaging between 24 – 26 degrees. Visiting Stockholm in The Off Season? Although the summer season may be hotter and sunnier, I would like to give a shout out to the off seasons as well. Spring and early autumn can be nothing less than stunning. Stockholm is a very green city, and seeing the city come to flourish in spring time is amazing. This is a beautiful time to walk around in parks, and in the city. It’s not packed with tourists, but you can still enjoy a hot chocolate on an outside seating at a cafe. The early autumn is just as beautiful, with the color changes in the nature. Often the weather is really nice at this time of the year, chilly but clear skies. Some people actually like the spring and autumn more than the summers. The best month to enjoy the springtime is in May, while the early autumn in September is amazing. The winter season is cold and dark, and the sun is only up for a couple of hours a day. Usually the temperatures average on -3 degrees. Snow is common in Stockholm, and the old town looks really cozy at this time of the year. If you go there before Christmas it’s especially nice since they have put up Christmas decorations everywhere and you can take a visit to the Christmas market. The Swedish Christmas food is very special, and in Stockholm there are many places to go to get the best experience and tastes of the Swedish Christmas. Another nice place to visit on a clear day is Skansen, which is open all year round. 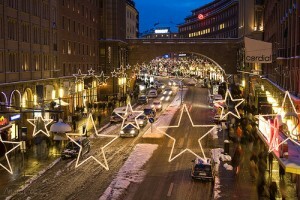 They also have a Christmas market, as do Gröna Lund (the theme park). There are few places in the world like Stockholm, combining the best of both worlds – literally. The city is a vibrant cosmopolitan place with great shopping, fashionable people, lots of bars and clubs and great little boutiques. At the same time you’re always surrounded by water, as it’s situated on 14 islands, and the nature is just around the corner. The water is perhaps the best example of combining the best of both; it’s salty AND sweet at the same time! Blue and yellow are the colors of Sweden. Here is a golden crown as a decoration on a bridge overlooking the blue waters of Stockholm, the capital city where the Royal family lives. 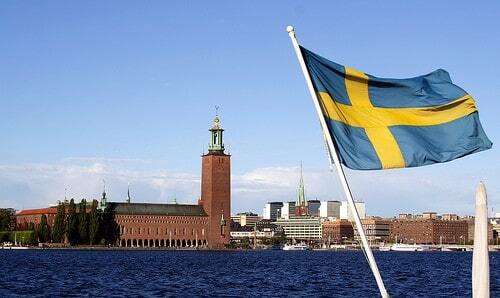 The three-edged Swedish flag has been raised here since the 1660’s and perhaps even longer..! This is where passing boats were greeted with the flag and a cannon salute. Blue is the color of the royalty and gold a symbol of wealth, and Sweden’s colors are blue and yellow – so what better colors to use for the Royal Park Gate than these? A road trip through the far north of Europe is the perfect way to explore one of the most beautiful regions on the planet. This is especially true during the short but intense summer period, when the locals tend to make the most out of the long hours of sunshine. Outside cafés and restaurants are generally filled until late and the large cities feel particularly lively during this time of the year. A perfect place to start your road trip through the Nordic capitals is in Stockholm. Built on 14 islands, the Swedish capital offers a unique beauty, combining nature with stunning architecture, great shopping opportunities and a vibrant night life. You should definitely give yourself at least a couple of days to experience Stockholm and visit some of the city’s best sights, such as the Gamla Stan medieval city center, the Royal Palace and the Vasa Ship Museum. Once you’ve spent enough time Stockholm, you can then take a car rental from Sixt to start on your Scandinavian adventure. 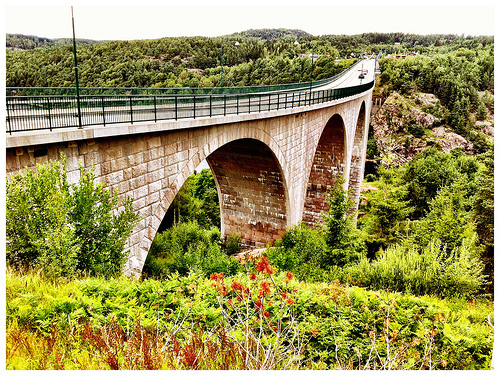 From Stockholm you can venture south driving along the beautiful Southern Swedish coast line. Some of the highlights along the way include a visit to the medieval castle of Kalmar and the glass works produced in the region of Småland. From there you can continue to the charming town of Ystad before reaching Malmö, the third largest city in Sweden, and finally crossing the famous Øresund Bridge to reach the Danish capital of Copenhagen. As with the Swedish capital, you should allow yourself a couple of days in the city, enjoying its lively summer atmosphere and visiting the main attractions such as the Little Mermaid Statue, Tivoli Gardens and Chistiansborg Palace. 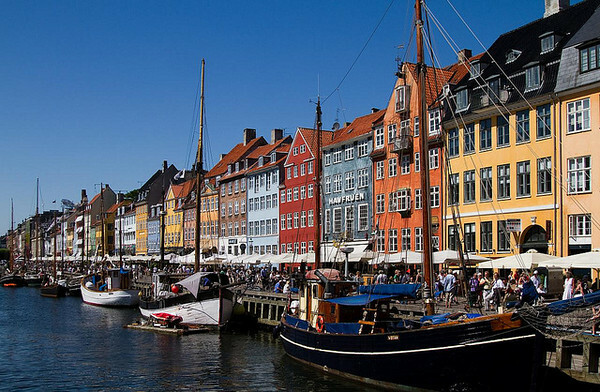 Also make sure to stroll along the beautiful harbor Nyhavn, it’s one of the most picturesque areas in the city! If you’re ready to take a break from driving, you can always drop off your car rental in Copenhagen and take the ferry from Copenhagen to Oslo. If you would prefer to drive, you can head across the Øresund Bridge once again, heading north from there to visit Sweden’s second largest city, Göteborg and heading further north to Oslo from there. On your way up you should definitely stop over in Göteborg for a day, exploring the old Haga, Slottsskogen and the many cafés lined along Linnégatan. It’s a great city full of life and atmosphere! When arriving in Oslo, attractions such as the Viking ship museum, the National Opera and the Holmenkollen Ski Museum are waiting. 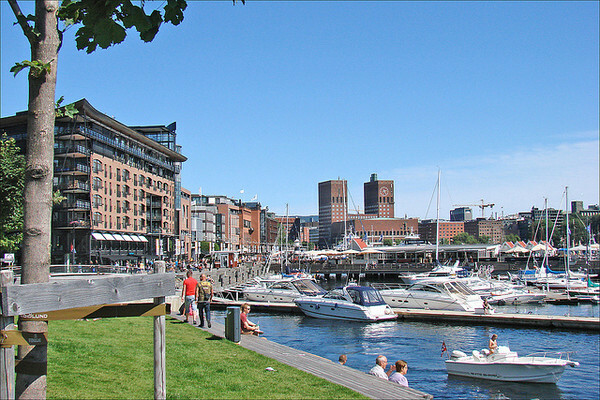 It is definitely worth noting however, that if you are on a tight budget, you may want to keep your visit to Oslo rather short as Oslo is infamous for not exactly being cheap. One of the best free things to do in Oslo is checking out Vigeland Park, the world’s largest sculpture park and one of the most popular attractions in the city. From Oslo, you can either drive back to Stockholm to complete your Scandinavian round trip, getting to explore inland Sweden along the way, or you can finish your trip there. The great thing about hiring a car is that you don’t not necessarily need to return the vehicle in the same city which allows for numerous options. For those on a tight schedule, just driving from Stockholm to either Copenhagen or Oslo may already be a great opportunity to explore Europe’s majestic North. Stockholm – London – Hong Kong – Kerikeri, and the best 360SEK I’ve ever spent! This entry is (probably) going to be brief (and undoubtedly littered with typos!) as I’m at the mid-way point in my journey from Stockholm, Sweden to Kerikeri, New Zealand. Sitting in Hong Kong airport at the travelers lounge, I’m enjoying possibly the best 360SEK (400HK$) I’ve ever spent. Feeling a bit worse for wear – yes, the 20 minute hot shower was definitely needed! My Chinese is pretty much what it used to be (which isn’t necessarily a good thing, as it used to be more or less non-existent). Which is why it’s great that the level of English in this ex-British colony is superb. Probably better than mine actually, given that my mind has been focused on Swedish, Norwegian, Danish, and German for the last 6 ½ year! Right, time to relax again, then that massage…then it’s another couple of hours wait, before a 2nd ½ day flight, 3 more hours waiting, 40 minutes in a mosquito, and then a short ride from the airport. The most famous song about Stockholm is one that every Swedish person knows, it’s called “Stockholm in my heart”, and is a song about the love locals have for their capital city. And even as a girl born and raised in Gothenburg, its “little brother” who wants to think it’s the better city, I have to say that it’s hard not to love Stockholm. There are few places in the world like this, combining the best of both worlds – literally. I love how a capital city can be so involved with nature, how you can just walk across a bridge and enter a huge park, or just hop on a ferry and escape the city within minutes to explore the ”country side culture” of Sweden. I’ve never been to another capital city where people go fishing in the middle of the city next to the Parliament – here, it’s part of many peoples’ every day life. The Old Town is so quaint, with houses in different shades of yellow and streets leading to everywhere or nowhere it reminds you of the villages you see in pictures in children’s books. But walking around in The Old Town I realized for the first time how ”lazy” we are in Sweden – nothing here was open until 11 am, and most boutiques closed around 4 pm or earlier. In most of Europe you’ll find shops being open from early morning to late evening. The changing of the guard at the Royal Palace was perhaps the best example of Sweden in general. While in other countries it’s something rather serious, in Sweden it was … different. After all the serious drumming and marching through town, some man cleared his throat in the speakers and said with many ”uh’s and eeh’s” that the orchestra would be playing a few songs …And they played… ABBA…! It can’t get more Swedish than a man fumbling for words at the Royal Palace (our king is known for just that), and the tunes of ABBA during the changing of the guard. Leaving on the overnight ferry to Finland, we slowly criss-crossed for 4 hours through the archipelago with islands dotted everywhere around us. Swedish red and white wooden houses and flag poles with the Swedish flag proudly blowing in the wind this was the perfect way to leave Sweden. It’s a beautiful last photo I took of Sweden, a good memory – until we visit there again next time. Being the capital of Sweden, Stockholm is a fascinating city comprised of 14 islands connected by numerous bridges. Scandinavian architecture is a characteristic feature of this lively city, and together with the magnificent Gamla Stan (Old Town) the city attracts millions of visitors every year. If you’ve planned to visit this beautiful city, here are three things not to miss! Gamla Stan is one of the main attractions of Stockholm, it is the largest and one of the most well preserved medieval city centers in Europe. Its winding streets represent the unique spirit of the old city which looks like taken straight out out of a fairy tale. Gamla Stan is full of museums, cafes, bars and restaurants. The Nobel Museum and Stockholm Cathedral are both situated here, but the most significant attraction here however is the Royal Palace, which is one of the largest palaces in the world. There is also a museum inside the palace exhibiting Royal costumes and armory, but the best part is to watch the changing of the guards outside the palace. After its completion in 1989, the SkyView became one of the city’s major landmarks. Stockholm Globe Arena is huge and shaped like a ball, situated in the southern part of the city and used for a large number sports and entertainment events. It took 70 tonnes of steel to build this attraction, and all the materials were lifted by helicopters and attached by mountaineers. The SkyView will take you along the outside of 130 meter high Globen in a glass capsule attached to the rails on the building. It fits 16 people and the ride takes about 20 minutes to reach the top. The view from the top is breathtaking: you see the whole city, even the glittering archipelago surrounding it. There are also guided tours showing you the inside of the building, and there is a good restaurant inside to grab some lunch afterward. A visit to Stockholm will not be complete without seeing the city from the water, so a boat tour is a must! There is a large number of different tours to choose from: Royal Canal Tour, Historical Canal Tour, Stockholm Grand Tour and Under the Bridges of Stockholm. You can also purchase a Hop On Hop Off ticket. Which is great for unlimited trips and it is also combined with a bus. For those who want to see the archipelago – an Archipelago Race is a great way to do so. After exploring the city’s major attractions it’s time to drop by one of the cafes for coffee and cake in a Swedish tradition, but be aware that Swedish coffee is pretty strong, but the cakes are absolutely delicious! In general dining in Stockholm is quite expensive and will cost you around 175-250SEK for a meal, so if you’re on a tight budget self-catering will be the best way to save money. Also look out for some lunch deals, there are often plenty to choose from and prices are often half of the normal dinner prices. Enjoy your stay in Stockholm! If you want to visit a place that has both beautiful nature, exciting cities and is off the beaten track, Sweden is a perfect choice. As it’s not normally on the itinerary for Europe travelers, it has the benefit of being everything but “touristy”, and you can easily experience the country like a local – that is, if you know how to. Summer is the best time of the year to visit Sweden, the country becomes alive and thriving, people go the the coasts to party and sunbathe and enjoy the warm weather. You have probably seen the idyllic pictures of red and white cottages surrounded by green forest by a lake, or perched on a rocky island in the middle of the sea. Many people go for short day cruises around the islands in Gothenburg or Stockholm to marvel at the picture perfect surroundings – but why not take it one step further and experience what it’s really like to live there? Renting a summer cottage by the lake or close to the beach will give you what is perhaps the most Swedish experience you could ever get. There are plenty of lakes in the country and many of the holiday cottages are secluded and have their very own pier and boats you can use to go fishing, water skiing or just exploring the hidden corners and bays of the lake. You will find that while the pace slows down in the cities and the crowds thin out, the livelier it gets at the popular summer spots along the coast lines. Different places are popular at different times of the year. During Midsummer, in late June, Bohuslän is a popular place, especially Smögen. Other fun places where there is a lot of great partying going on is Båstad, Visby and Tylösand. In July there is an extremely popular Tennis week event in Båstad where people party all day long. There is no better way to get a “taste” for Swedish culture and history, and a glimpse into the people than to try their traditional food. One very typical Swedish dishes is Swedish meatballs with mashed potatoes, brown sauce, green peas and Lingon berrry jam. Another typical dish is the pea soup and pancake, which traditionally is to be eaten on Thursdays. The most traditional version includes bits of meat, but vegetarian versions are also common. The pea soup includes a number of different spices, but Swedish people like to add a bit of extra mustard to it as well. The pancake is eaten after the pea soup, but the traditional way is to serve them both together. Taste Of Stockholm – Must Try Food! 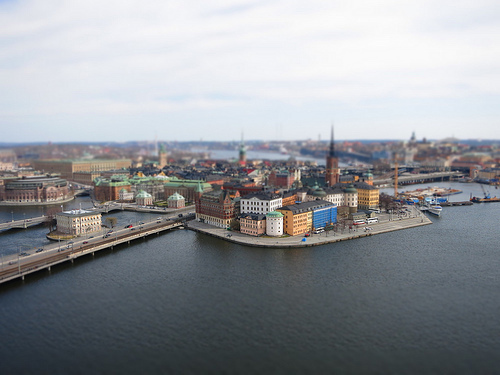 Stockholm is a city scattered on fourteen main islands connected by bridges – thanks to numerous waterways the city earned the name of “the Venice of the North”. The city is very organized, stylish and funky, and the restaurants in Stockholm are absolutely superb. With a great variety of restaurants, bars and cafes, you will never be short of places to eat, and trying Swedish cuisine in Stockholm is one of the things that you really shouldn’t miss. Even though modern Swedish cuisine is highly internationalized, there are still some typically Swedish dishes that everyone should try. Swedish cuisine doesn’t use any fancy spices or herbs, but instead prefers salt, white and black pepper – the dishes mainly consist of some sort of meat, fish, potatoes, salad and cream sauce. Pickled Herrings – Pickled herring is one of the most famous traditional Swedish dishes, and can be prepared in a variety of styles. Some love it, most hate it – but try it for the experience! Janssons frestelse (Jansson’s temptation) – this is a traditional Swedish dish that has a special place at every Christmas table. It is made of potatoes, onions, herring, pickled sprats and cream. Pyttipanna (Leftovers in a pan) – if you have potatoes, onions and ham in your fridge then you have all necessary ingredients for Pyttipanna. All the above mentioned ingredients are chopped and then pan fried and seasoned with salt and black pepper. It is usually served with some beets, fried eggs, capers and pickled gherkin on the side. Ärtsoppa (Pea soup) – it consists of yellow peas, pieces of onion and pork and is very often served with a little mustard. Traditionally served on Thursdays along with pancake and whipped cream (for some unknown reason). Makaroner och Falukorv (Macaroni and Sausage) – macaroni are simply cooked with milk and have a nice creamy taste. It is served with a special type of fried sausages and ketchup and is one of the kids’ favorite dishes. Swedish Fast Food – Pizza, hot dog, kebab and falafel are the main fast food dishes in Stockholm. There are a lot of hot dog stands all over the city and you should also try a famous Swedish specialty “tunnbrödrulle” – a hot dog in a tortilla with mashed potatoes and shrimp salad. Sweets – there are tons of pastry shops and bakeries scattered around Stockholm – drop by one of them to try homemade ice cream, princess cake or cinnamon buns. If you are a fan of coffee, Stockholm is one of the best places to enjoy this aromatic drink. Swedish consumption of coffee is known to be among the highest in the world. For Swedish people it is more like a social ritual when you can enjoy the cup of coffee and discuss the latest gossips and news. Have you ever spent months planning a really great trip? Most people do, especially if they are going somewhere that they’ve been dreaming about for years. However, many of us sometimes feel like there’s something missing, but we can’t put our finger on it. We hit all of the major tourist attractions, try the restaurants recommended by the guide books and choose one of the highest rated hotels. Still, we end up feeling like we’ve just scratched the surface of Amsterdam. The reason that you might feel like you missed out on something on your vacation is because you were visiting the city like a tourist, when it would have been better to discover it like a local. That’s the beauty of services that makes it possible for visitors to see the sights like locals do. It gets you off the beaten path and takes you to hidden places. What’s more, you get a chance to meet some interesting people who can give you an inside look at their home city. Planning a cycling adventure with a local, offers the possibility of a bike tour in lots of places from Rome to Kuala Lumpur, but by far one of the most popular places to tour by cycling is Amsterdam. That’s because Amsterdam was built for cycling. An Amsterdam cycling vacation is the ideal choice because cycling is a way of life here. It’s how most people get from point A to point B, and it really is the easiest way to make the most of your time there. You’ll have plenty of opportunities to see all the sights in a leisurely fashion without worrying too much about traffic. Just about all of Amsterdam’s streets are designed with bike lanes, so you can get absolutely anywhere. Plus, the city is built on a flat plane, so there’s no need to worry about burning through all your energy on hills. You can see how easy it is to cycle through the city by The Most Exciting Bike Routes In Amsterdam. A cycling tour of Amsterdam can take you to all of the must-see sights. By far one of the most popular of these is the neighborhood of Jordan. This neighborhood has transformed from mainly providing homes for Amsterdam’s working class to being a center of art and culture. Here, you’ll find an endless supply of unique restaurants, shops and galleries. Wander through Jordan’s winding streets on your bicycle, and you’re certain to encounter an uncommon eatery or an unusual souvenir that you’ll never find anywhere else. If you venture into Jordaan, you won’t want to miss an opportunity to visit the Anne Frank House. Anne and her family lived in the home for two years while hiding from the Nazis. Thousands of people now visit the museum every year to learn more about this extraordinary young woman and the historical events that tragically took her life and the lives of millions of other Jews. Jordaan also is the right place for visiting some of Amsterdam’s incredible markets. With Lindengracht and Noordermarkt, there’s something for everyone whether you’re looking for fresh, local produce or one-of-a-kind handcrafts. Another can’t-miss spot in Amsterdam is Museumplein. Here, you’ll find not only the works of well-known masters at places like the Van Gogh Museum, but also some of the most unusual exhibits in the world. How would you like to tour a museum about cats or see one of the most impressive collections of handbags in the world? If that’s not to your taste, you can always settle for the grand Rijksmuseum where you’ll discover one of the most comprehensive and impressive collections of Dutch artwork that has ever been displayed. Don’t forget to spend some time in the museum’s gorgeous gardens. Speaking of gardens and the outdoors, you’ll want to set aside time to enjoy a few of Amsterdam’s 30-plus parks. In fact, wasting a few hours in a beautiful park is one of the best ways to live like a local. Bring along a bag of food from a nearby eatery and a bottle of wine, and you have everything you need for an impromptu picnic. The people watching is second to none. Plus, there are beautiful fountains, memorials, gardens and special events to attend throughout the year in Amsterdam’s parks. Don’t be shy. Friendly locals are happy to introduce you to some of their favorite spots in the city. If you have enough time, it is well worth your while to take your bike on an adventure outside of the city. You’ll find 17th century architecture, ancient market towns and windmills all within a comfortable ride. In Beemster, you’ll see farmhouses that have stood for more than 300 years. Middenbeemster will treat you to several windmills that have been classified as a World Heritage Site by UNESCO. Perhaps you’ll also explore historical Edam, which has flourished since the 16th century thanks to its fabulous cheeses and brisk trade in fish. From here, you can cycle to the 12th century village of Hoorn, seeing ancient houses, picturesque gardens and unique art galleries. Back in the city, you might make some time to sample the local brews. One of the best places to do this is at the IJ Brewery. This small operation is housed in a former bathhouse, and its neighbor is the De Gooyer windmill. You’ll be able to enjoy a unique brew while sitting outdoors in the shadow of a classic windmill. Is that possible anywhere else in the world? Amsterdam is a unique city that combines ancient history with modern innovation and sensibilities. The absolute best way to see it is from a bicycle, especially when you have locals to guide you to all of the best spots. Whether you want to tour all of the world-class museums or spend hours just kicking back in a park, Amsterdam is the place to be. Very good to know! I would love to visit Stockholm. I just can’t imagine being somewhere that’s light 23 hours a day! I went on an Alaskan cruise a few years ago, and as we went further north, the lighter it stayed at night. A few nights, it looked like a sunset all night and never got fully dark, so it was great that we had thick curtains. That would be wild to be somewhere where it’s really bright all the time–seems like it would be disorienting. Wow nice place. You made it sound so perfect to travel. There are a lot of blogs on the internet now a day but only few have good information. I will definitely bookmark this and come back again for more information. The benefits of reading are so obvious. Actually, everyday I am amazed with the kind and bulk of information I get to read in the internet. I believe that your input is outstanding. August/Septemer would be a perfect time to travel there. Haha, it may sound depressing, but 10 degrees is warm for being March..! April is known to be a month where it’s warm and sunny weather one day and cold, rainy and hail the next – in other words, don’t go then! I’m glad you like our site, and thank you so much for your sweet comment! I agree! I went to Stockholm in mid-October, and while it was chilly, it was absolutely gorgeous–all the leaves on Djurgarden were changing color! I definitely wouldn’t want to go in the dead of winter, but I’m dying to head back for Midsummer! I have never been to Stockholm but would love to go visit a friend of mine there. I would love to go during the summer but my Dad just returned from a short trip there in October and the fall colors in his pictures were gorgeous! Weather is always a big factor to consider when planning a trip. Oftentimes I would opt to go during spring or summer but in places around Asia, it is better to visit when it is a bit colder. Hot air and humidity do not work for me. Midsummer would be a great time to visit! It’s one of the Swedes most loved celebrations of the year, and you’ll really get a good chance to experience the Swedish culture, try the Swedish food and typical drinks, dance around the maypole etc. But if you’re going to Stockholm, make sure you head out to the islands, that’s where it all happens! Hi Joya! Yes, the autumn is really beautiful in Stockholm, and since there is so much nature around you really get to enjoy the fall colors to the fullest! When to go all depends on what you want to see and do. I agree. I’ve made the mistake once of not checking what kind of weather it would be in the country before booking the tickets. It turned out to be the thunderstorm season with 30 degree weather and 85% humidity. We turned out to be very lucky as it barely rained at all, but the humidity was just crazy! Stockholm, to sum up in one word; Beautiful. It is an amazing city, in the summer it is quite lovely and is always hot and at night it is very warm and the city is just alive! In winter the weather can be cruel but the city is just too wonderful that the weather can’t dampen your spirit. Stockholm is a really special place. Impossible to be disappointed. A must see before you die city.